an infinity symbol placed diagonally in a heart -- meaning infinite love. a butterfly -- symbolizing peace, grace and good luck. 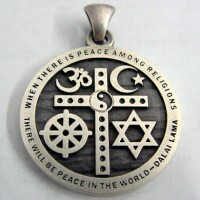 a circle: a basic interfaith symbol. two hands cupped, gently cradling a butterfly. A winged heart -- a Sufi symbol. Azure Green sells a 2.5' circular universal lotus magnet with symbols from 16 of the world's spiritual traditions. See http://www.azuregreen.net and a similar 4" diameter window sticker. Harn Gallery connects artists and collectors around the world through a curated marketplace for affordable, original art. They offer artists the highest commission rates (80% of the selling price). See: http://www.harngallery.com. These take the form of bracelets, pendants, keychains, necklaces, etc., often engraved with a memorial message. Cremation jewelry is hollow inside so that one can carry a small sample of the deceased's ashes. Each piece of Bindhu spiritual jewelry is created by Sindhuma Ishaya, an Ishaya monk. See: http://www.bindhu.org/ TheIshayas' web site is at: http://www.ishaya.org.